The Pretenders are set to play an intimate show at the newly reopened Subterania on the 26th April. 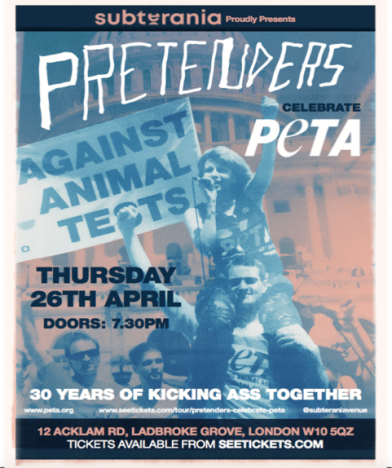 The show will celebrate Chrissie Hynde’s thirty years of activism with PETA. In an era when many limit their activism to social media posts and empty gestures, Chrissie’s committed and fearless work has exposed and halted a long list of cruelties, helping PETA grow into the world’s largest animal rights organisation. Over the years Chrissie has been involved in countless campaigns that have helped to raise awareness for PETA, putting them on the pop culture radar and assisting them in achieving key victories. Before labs stopped using chimpanzees in futile AIDS experiments, Chrissie led a PETA/ActUP rally at the US Capitol exposing animal cruelty. She was also arrested in Paris for blocking the doors to a KFC – helping to expose the chain’s practice of live-scalding birds. The Pretenders most recent album, 2016’s ‘Alone’ was a critical success and a welcome return, coming eight years after the band’s 2008 LP ‘Break Up The Concrete’. Chrissie joined Arcade Fire on stage at Wembley Arena this week to perform a thrilling rendition of The Pretenders’ classic hit ‘Don’t Get Me Wrong’.